Published: Sept. 17, 2009 at 09:46 a.m. The sideline matchup between coaches Rex Ryan and Bill Belichick takes center stage in the Jets-Patriots rivalry. Located three-and-a-half hours apart on I-85, this is a popular road trip for fans of both teams. The highlight of the series for Atlanta was in 2002, when the Falcons shut out Carolina in two regular-season games by a combined score of 71-0. White grew up in South Carolina and won state high school championships as a wrestler. He is the top receiver on a team with many offensive weapons. He's coming off a Pro Bowl season with a new contract after setting team record for receiving yards in 2008. White has very good hands and is a strong, physical receiver who will block the run. He's very underrated. Gamble is the tall cornerback every team likes to have. He has very good ball skills - with 20 interceptions in his first five NFL seasons. The 2004 first-round pick played both ways at Ohio State, and has started since Day 1 in Carolina. Mini-matchup to watch: Sam Baker, Atlanta's second-year left tackle, versus Carolina's Pro Bowl DE. Julius Peppers. Minnesota has won 16 of 18 games against Detroit since 2000. If the Lions want to reverse that trend, they have to handle the Vikings' defensive front four and protect the passer. Allen lines up at right defensive end in Minnesota's 4-3 defense. He has excellent quickness off the ball, is very active, and never stops giving great effort. He's an excellent tackler -- when he gets his hands on the quarterback, the quarterback goes down. Allen may be particularly fired up this week, as he was shut out in Week 1 against Cleveland's Joe Thomas. The Vikings won handily, but Allen was held to one assisted tackle. Backus is a former first-round pick who has started every game for eight consecutive seasons (128 games) -- the longest current streak for any active NFL lineman. He's a solid player who is bothered by back problems from time to time. Cincinnati put up fewer points than any team in the NFL last season, scoring 20 or more points in just four games, with a season-high of 23 points. Palmer missed most of 2008 with an elbow injury. But with Palmer back, it was more of the same when they were held scoreless for the first 59 minutes of Week 1. Palmer was the first overall draft pick in 2003 -- and the first top overall pick since 1970 that did not play a down as rookie. From 2005-07, he threw for 86 TDs and 12,002 yards. Overall, he was the fifth-fastest player in NFL history to reach 100 career TD passes. He has very good arm strength and accuracy to go with a very good understanding of defenses. He is the glue that holds the Bengals together -- he has outstanding character. Woodson is coming off a Pro Bowl season in 2008. He has a very strong upper body and is a very good tackler. He strips the ball. He can attack the pocket as a blitzer. He plays off receivers in Green Bay's new scheme rather than press, as he did before. And he is still susceptible to double moves -- like what happened Sunday night against Chicago's Johnny Knox. In only the third meeting between these two teams, both the Cardinals and Jaguars are coming off Week 1 losses. This matchup features a pair of Division I-AA players from Virginia. Hightower, who was not invited to the combine prior to the 2008 draft, established himself during his rookie season as a do-everything player. He was discovered by former Cardinals assistant Maurice Carthon at a campus workout. A good all-around player, he can run , catch, block, and keep defenses from keying on him. Hightower, who had 10 rushing TDs in 2008, caught 12 passes last week for 121 yards. Durant had a team-leading 10 tackles last week against the Colts. He plays fast -- he ran a 4.62 40 at 240 pounds at combine in 2007. He will hit someone on every play. Durant had 17 tackles in a wild-card playoff game against Pittsburgh in 2007. He has the ability to make plays in space, which he will need to do against Hightower and the Cardinals. This is the 101st meeting between these two original AFL teams. Bitter rivals, they have met 97 times in the regular season and three times in the postseason. Since 2003, the Chiefs have won 10 of 12 in the series. The two losses have come at home, however. These teams don't like each other, and their games are always hard fought no matter what the records. Hali was a first-round pick in 2006 who played defensive end until this season. He now lines up at outside linebacker in the new 3-4 scheme. Everything he does is built off first-move quickness. He has a good feel for the rush, knows how to set up a tackle, and he likes to use head fakes. He will struggle against big tight ends. McFadden was limited as a rookie in 2008 due to a foot injury, but he has great speed and quickness. He will block in pass protection and also is a good receiver. He runs inside or outside with strength. Look for big things in the future from him. 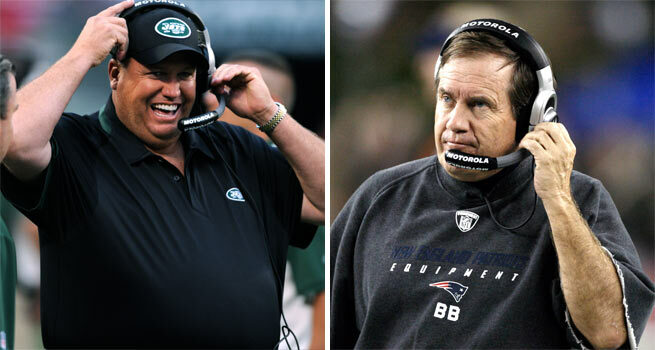 The Patriots-Jets rivalry has been heated in recent years and this is a highly-anticipated coaching matchup. There will be more hype for this game for many reasons -- not just because Ryan made a comment about not kissing Belichick's Super Bowl rings. Most of all, this is a matchup between two very good teams with quarterbacks everybody is talking about. Both coaches come from defensive side of the ball. Ryan's defense is built on all-out effort and toughness. Belichick's defense is scheme-oriented. His defense is known for identifying the one opposing player that poses the greatest threat to beating them and taking that player out of the game (as they did Monday night against Buffalo with Terrell Owens). The big question for New England's defense will be the effect of an injury to linebacker Jerod Mayo. In Week 13 of the 2007 season, Ryan -- as defensive coordinator for the Ravens -- gave the undefeated Patriots all they could handle, before the Pats won, 27-24. Of course, there is plenty of attention placed on both teams' quarterbacks. While Drew Brees threw six TD passes last week, the real media swarm, as usual, surrounds Donovan McNabb and his health status. If McNabb plays with his broken rib, you can be sure Saints defensive coordinator Gregg Williams will have some blitzes in store for him. And Williams knows McNabb well from his four years with Washington. Vilma is the centerpiece of Williams' defense in New Orleans. The Saints traded for him before the '07 season. He has good reactions, moves well in space, and competes hard every down. He had 132 tackles in 16 starts last year. In Week 1 vs. Detroit, Vilma had four tackles and a sack. No matter who plays QB for Philadelphia, Westbrook is the player that can beat you. Westbrook may be the toughest matchup in the NFL for defenses. He can run inside or outside, is an outstanding receiver (he caught 90 passes in 2007), and will block in pass protection. Plus, he's healthy after sitting out the preseason. Westbrook is very strong with great quickness. Houston-Tennessee games have a little extra meaning this year, as it's the 50th anniversary season for the American Football League, and the Titans franchise played as the Houston Oilers from 1960-96. Houston had lost seven straight to Tennessee before winning 13-12 last December in Houston. Both teams lost their season openers -- Tennessee on the road in overtime against Pittsburgh, while Houston did not look good at home in a loss to the Jets. Johnson caught 115 passes for 8 TDs and 1,575 yards in 2008. He has excellent size and speed to separate, is an excellent slant threat and a very good deep route runner. He has a straight burst after the catch. Johnson is an average blocker, but an outstanding receiver. Finnegan, the Titans' right corner, started in the Pro Bowl in 2008, when he had five INTs. He has very good ball awareness, is a good tackler with very good speed to run down the field with fast receivers. This is a small-school find (Samford) by the Titans scouting staff. The Redskins have controlled this series since these teams first met in 1937 -- although the Rams upset the Redskins in Washington just last season, winning 19-17 in Week 6. Despite last year's result, however, Washington's home crowd makes FedEx Field one of the toughest open-air stadiums for visitors. And by the way: St. Louis beat Dallas a week after that Redskins game last year, but the Rams have lost 11 consecutive games since then. Haynesworth signed in the offseason for one of the largest contracts ever for a defensive player. One of the most dominant payers you'll see, he has great power and makes other linemen look small. He is very explosive with great quickness. Jackson might be the most complete running back in the NFL. He can run, catch, block in pass protection. When healthy, he's been very productive playing for a team that lacks talent around him. I would love to see him play on a good running team like the Giants. While the history of this series only dates back to 1976, it's hard to believe that this will be Tampa Bay's first-ever regular-season game in Buffalo. Overall, the Buccaneers hold a 6-2 advantage in the series. Of course, this is a matchup of teams that fired their offensive coordinators one week before the season began. Both teams are coming off Week 1 losses in which they played tough. Talib starts at left corner for the Bucs. A first-round pick last season, he is tall with good ball skills for the position. He is good versus the run and is a good competitor. T.O. is both the most talkative and most talked about player in the NFL. He caught 38 TD passes from 2006-08. In the Monday night loss to New England, the Patriots doubled him almost every play, limiting his Bills' debut to two catches. Owens works hard to get open, but will drop passes he should catch (and catch passes he shouldn't). Look for the Bills to excite fans and find a way to get him the ball. Both of these teams are coming off Week 1 victories. Seattle, with a healthy Matt Hasselbeck at quarterback, has lots of offensive weapons. San Francisco played very good defense in a road win over defending NFC champ Arizona. Carlson led the Seahawks in receptions and yards as a rookie last season. He got off to a strong start in 2009 with six catches and two TDs last weekend. He can play on the line and block or flex out and cause matchup problems. He has very good hands and is good running after catch. At 6-foot-5, 260 pounds with 4.75 speed, he creates matchup problems. This is a battle between two teams favored to win their divisions -- one coming off a big Week 1 win, (Pittsburgh), the other (Chicago) coming off a tough Sunday night loss. It's surpising to note these teams have not played as often as one might think. They met six times in the 1930s, but just 24 times overall in 75 years. Hester is the Bears' leading receiver. Pittsburgh is always very tough to run on -- -negating Matt Forte's value -- so Chicago needs Hester to step up in a game like this. Hester has dynamic speed and play-making ability. He has good hands, and he is improving as a receiver. In 2008, he caught 55 passes while playing less than full-time. He has ability to make people miss. Watch for him on trick plays. Taylor is the starting left corner. He is a very good athletic cover man who will blitz off the corner. He has the ability to run with and trail receivers. He is in loose coverage when the Steelers are blitzing, but he also has good ability to jam and re-route receivers. Not a real ball-hawk, though. And he's a good special teams player if needed. Denver is riding the momentum from its improbable game-winning play at the end of last week's win over Cincinnati. The 87-yard touchdown pass to Brandon Stokley was the longest game-winning play from scrimmage ever in the final minute of an NFL game. And now the Broncos come home to face a Cleveland team they have defeated in eight straight meetings. This matchup isn't head-to-head, but it's a look at two of the best young offensive linemen in the NFL. Thomas is a treat to watch -- he held all-pro defensive end Jared Allen to one assisted tackle last week. Thomas has great feet, long arms, and great hand placement for a lineman. He is able to redirect pass rushers. Clady is a second-year player who performed as well as any left tackle in the NFL last year as a rookie. He has very good feet and quickness for the position, and long arms make it tough to get around him. You can be sure Baltimore offensive coordinator Cam Cameron will offer ideas this week to Ravens defensive coaches about his former team's offensive personnel -- starting with Philip Rivers, who posted the highest passer rating ever for a QB not invited to the Pro Bowl last year. Meanwhile, under Cameron's guidance, Baltimore has shifted from a team that ran the ball 57 percent of the time last season, to a team that has passed more this preseason and through Week 1. Suggs had eight sacks and two interceptions in 2008, returning both picks for touchdowns. Suggs can give you fits going forward to rush or dropping into space. He has a great first step rushing and is athletic enough to drop into space and cover backs and tight ends with ease. McNeill was a second-round pick because of a lumbar spinal injury in college. In 2006, he was the third rookie lineman to be selected to play in the Pro Bowl (Chris Hinton and Richmond Webb were first two; Joe Thomas became the fourth). McNeill has long arms and quick feet. He's a good pass protector for Rivers' blind side. Everyone thinks they can get by this guy, but very few do -- and not very often. This will be one of the most-watched games on TV this season. Both teams have great fan bases, both have very good quarterbacks, and this will give millions of people the chance to see the Cowboys' new stadium. Umenyiora missed the entire 2008 season with a knee injury, and he made the best of his return last week. He basically had a grand slam against Washington with a sack, forced fumble, recovery, and touchdown. Umenyiora led the Giants in sacks over the previous four years. He has a very quick first step in rushing the passer and has very good strength and athletic ability. Adams is big and strong with very good athletic ability. He plays better at home because of a hearing problem that causes him to sometimes struggle with noise on the road. These players know each other very well, playing twice each season. Mini-matchup: Giants DT Justin Tuck versus Dallas G Leonard Davis. Tuck has had great success against Dallas. The Colts catch a break by not having to play a day game in the Miami heat. The Dolphins did not play well last week in the loss to Atlanta. The Colts, meanwhile, were not very impressive in a win over Jacksonville. The Colts are without receiver Anthony Gonzalez, who caught 57 passes in 2008 and took pressure off Wayne. Still, Wayne is a big-play receiver, smooth in and out of his breaks. He can run with the ball after the catch. He will make the tough sideline catch, and he loves to catch the stop fade. This will be a homecoming of sorts for Wayne, who played at the University of Miami. Smith is Miami's second-round pick from Utah who is starting ahead of first-round pick Vontae Davis. You know Peyton Manning will be looking for him often to test his ability. Smith, who came to Utah as a running back, is very fluid for his size. He has very long arms and uses his height and arms at the line of scrimmage to disrupt receivers. He will support the run.